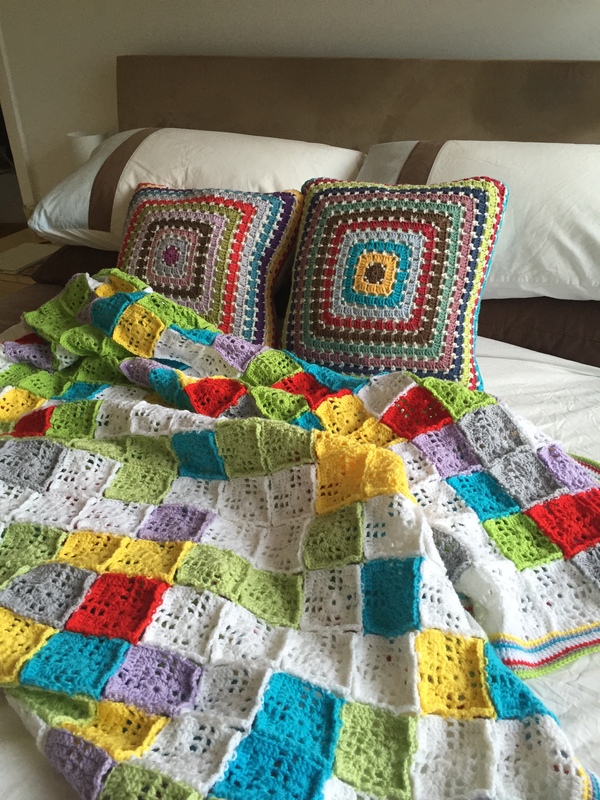 While I was in Cape Town I of course did a bit of crochet. I worked on the Convergence top (it’s half way done!) 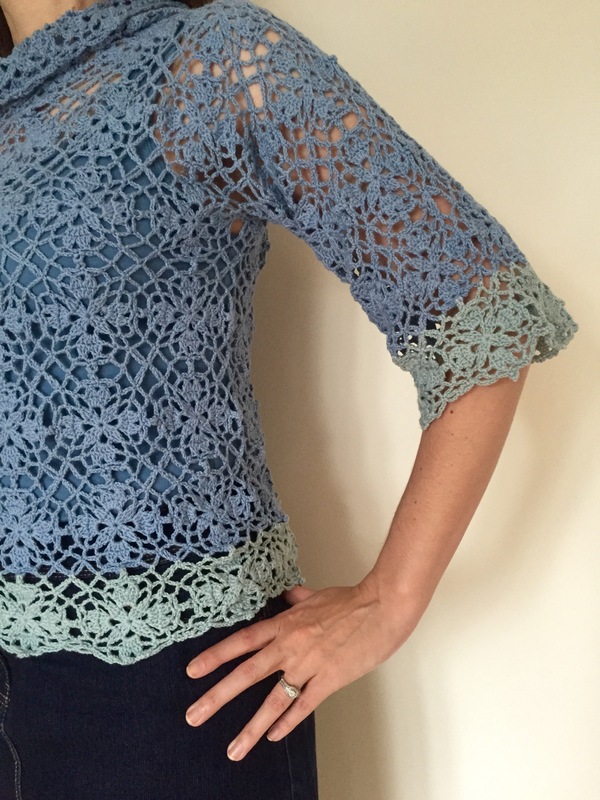 and finished one sleeve of this crochet top. I ran out of Vinnis Serina Bamboo yarn just before I left for Cape Town. I left the front piece, back piece and one sleeve in the UK, bought the extra yarn and finished the second sleeve while I was there. Yesterday I sewed all the pieces together and today I wore my top. I was positively glowing with pride. I just love it! 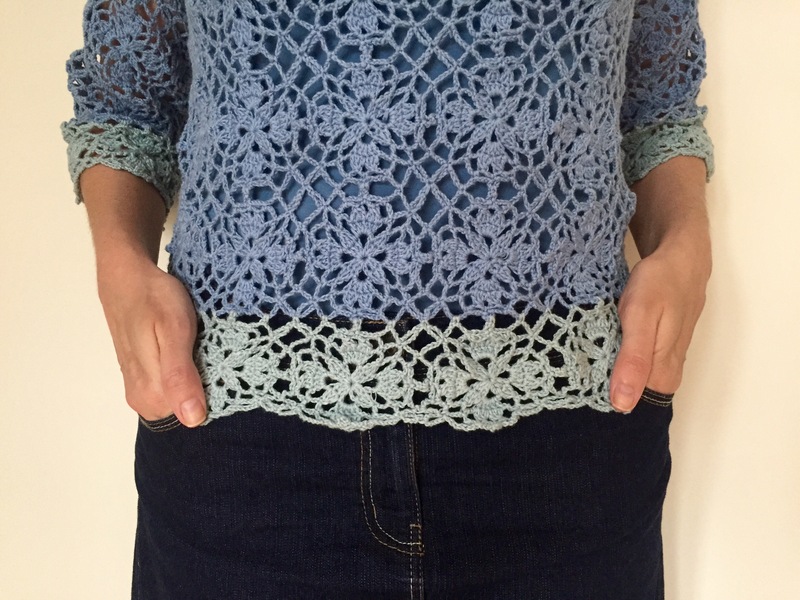 I am over the moon with this pattern and the Vinnis Serina yarn! 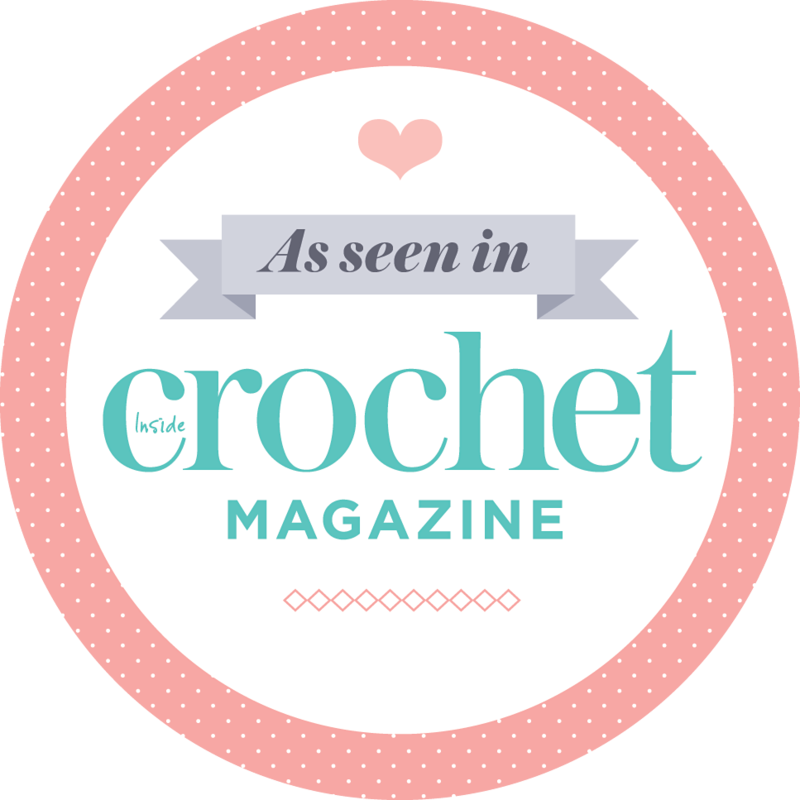 As I mentioned in this blog post, Drops Design Collection 136 contains the most beautiful collection of crochet pieces for me. I already made Whispers and Country Dreams, and now pattern 136-23 “Blues” Jumper is my third and I have to say, it’s my favourite. The pattern was easy to follow and it works up really quickly. The square motifs are done quickly “join as you go” and they make up almost half of the top. For me it went even quicker because I didn’t have any colour changes. Not that I needed colour changes to make my top interesting – look at the subtle marbling from the hand dyed yarn. Isn’t it amazing?! 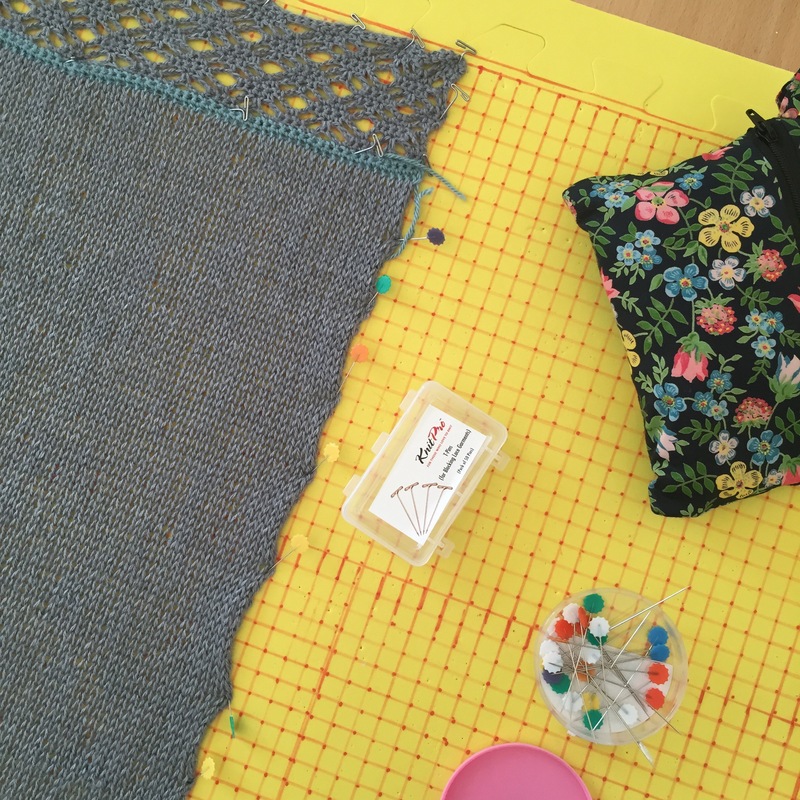 As for the Vinnis Serina bamboo yarn – oh my word. So super soft! I am aware though that the yarn has a tendency to sag a bit after a few hours of wear. There is no cotton in this yarn that will help it keep its shape; it’s just 100% bamboo. That makes for a super lustre and lovely drape, but it can become “floppy”. To compensate for this, I made my top in Size M, even though my measurements are for a size L. It worked like a charm. The top fits beautifully and even if it does stretch a bit during the day, I’m not going to look like a bag lady by the end of the day. 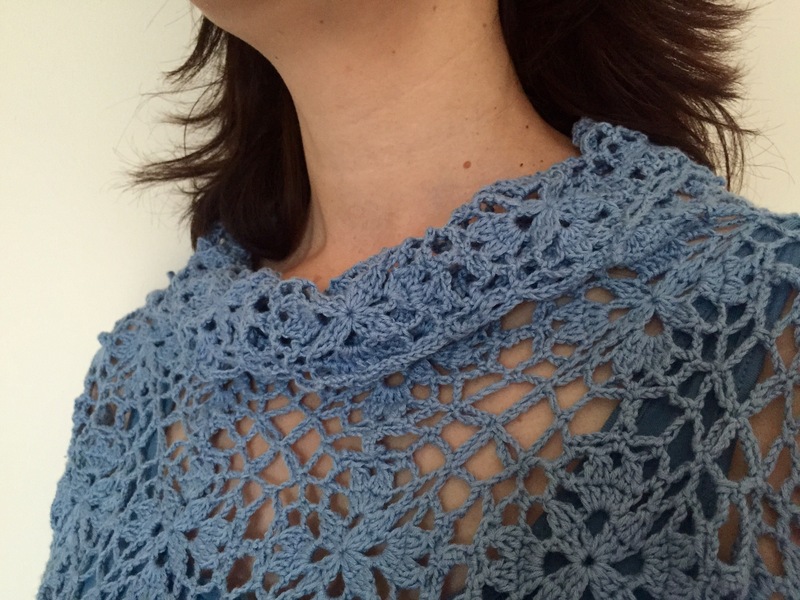 Modifications: An extra row of SC around the neck before doing the edging. Also using a larger size crochet hook for the sleeves as I know from previous experience that Drops Design sleeves tend to be a bit tight for me. I have a few crochet wearables that I don’t really want to wear outside the house, but this one is definitely not one of those. 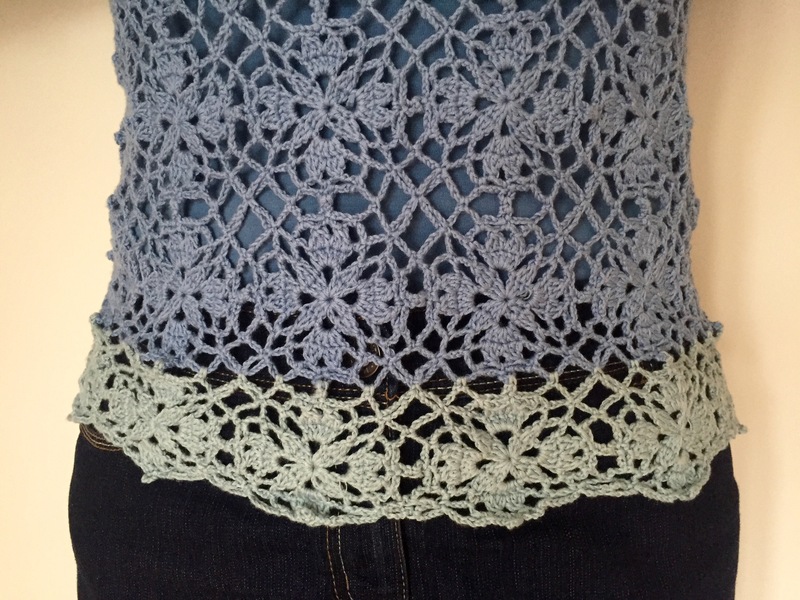 If you’ve never tried crocheting a wearable piece, give this pattern a try. It’s a winner! 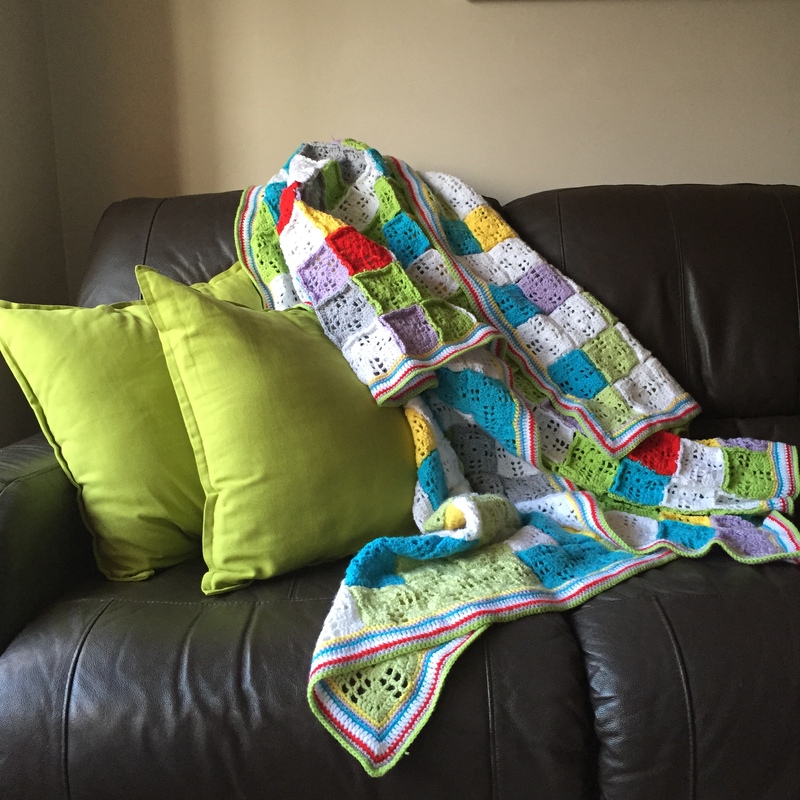 Crochet Mood Blanket 2014 ta-daaah! Behold my Crochet Mood Blanket 2014!!! All 357 squares of it in its colourful glory! 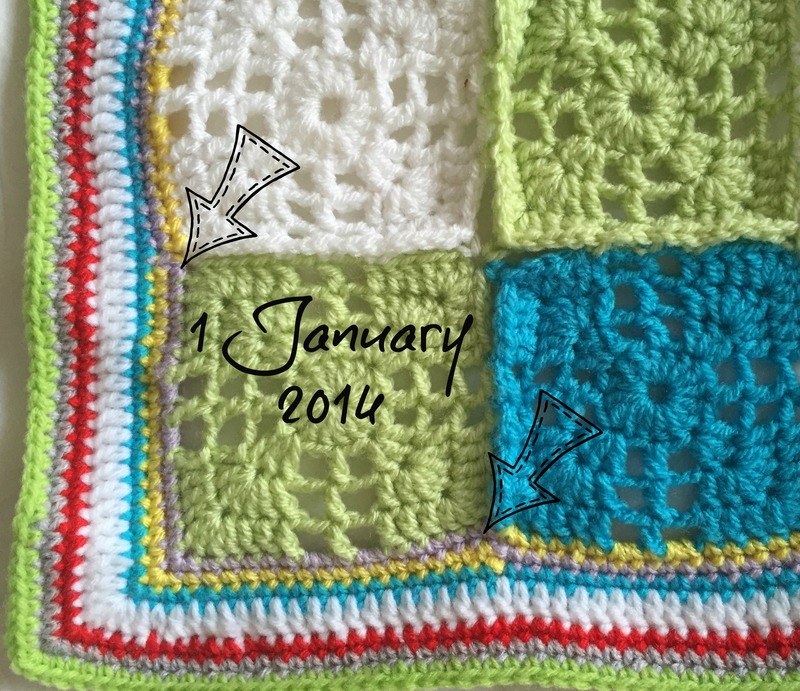 I started it on 1 January 2014 and completed it 31 December 2014 – precisely one year in the making. 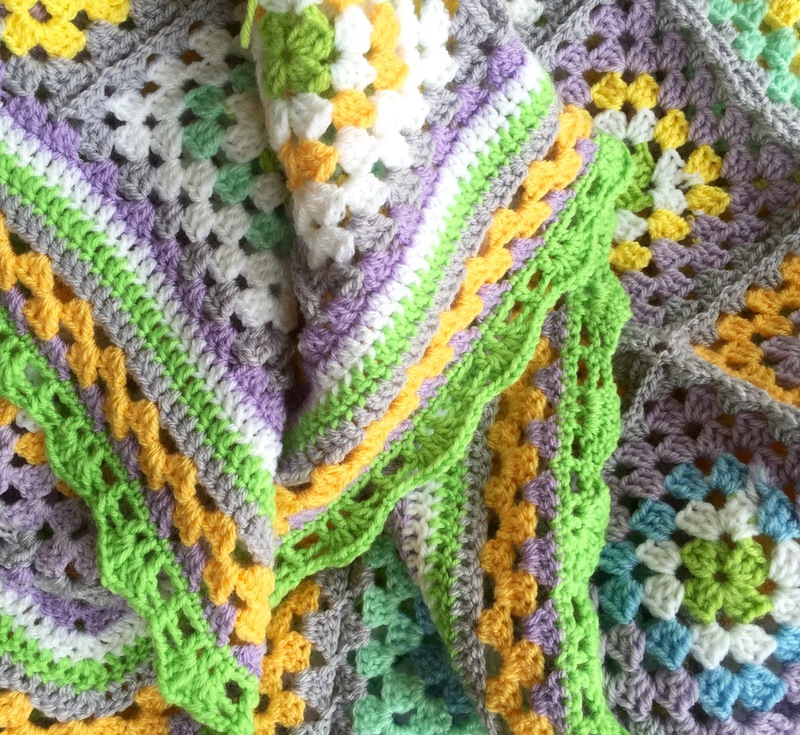 The Crochet Mood Blanket is the brainchild of Stacey Wentworth-Hall (@frofunky on Instagram). 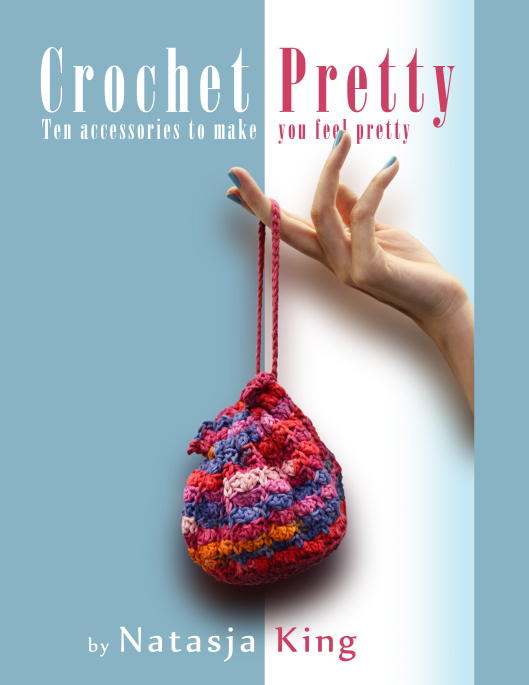 You basically just crochet or knit a block or stripe everyday (or once a week if that suits you better) using a colour that you feel reflects your mood. If you would like to get on board for 2015, have a look and join the Facebook Group here. Our blanket will be moving between the living room and the bedroom. I just love how colourful it is! It cheers up any space! The Mood Blanket has taught me a lot about myself and how my moods change. John said the blanket is a testament of his patience 🙂 I love that for years and years to come I will always be able to look back at my blanket, and therefore on my emotions during 2014. It’s been a good year and for that I am very, very grateful. The border I chose for my Mood Blanket is a variation on Border #39 that I used for my Dad’s Atlantic Waves Ripple blanket. 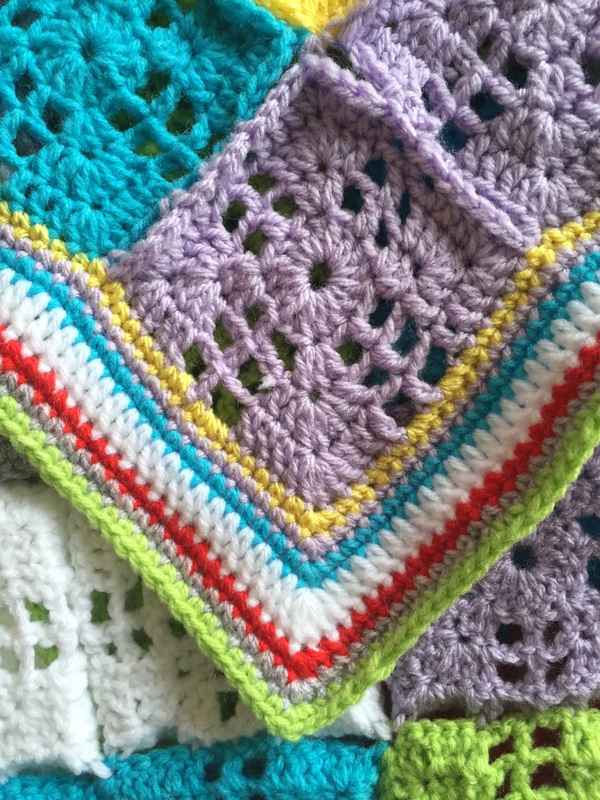 The border is made up of three rows of single crochet, a row of double crochet (which in the original Border #39 is a treble) and a final three rows of single crochet. I used all seven of my colours for the border. 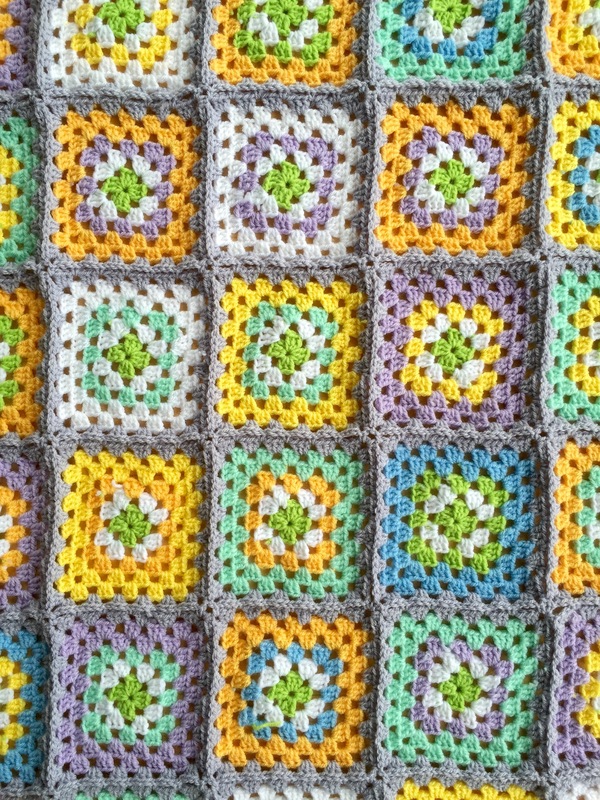 Seeing as the Crochet Mood Blanket is based on the days of the year, I wanted to be able to remember where it all started. In other words which square represents 1 January 2014? I did this by switching around the colours of the first two rows of the borders. See? Around the square for 1 January, I used purple as the first row, whereas for the rest of the blanket I used yellow for the first row of the border. I don’t think anyone else would even notice this small switcharoo, but it’s the perfect reminder of my very first mood of 2014 – in this case a happy lime green. Border: No. 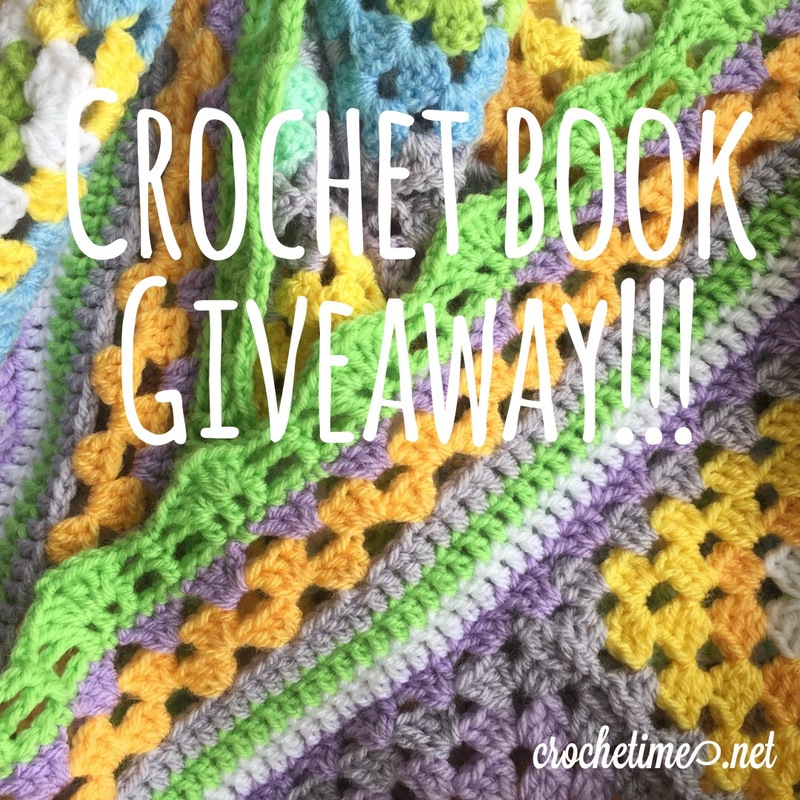 39 from Around The Corner Crochet Borders by Edie Eckman. Size: 21 rows of 17 squares, which makes 357 squares. 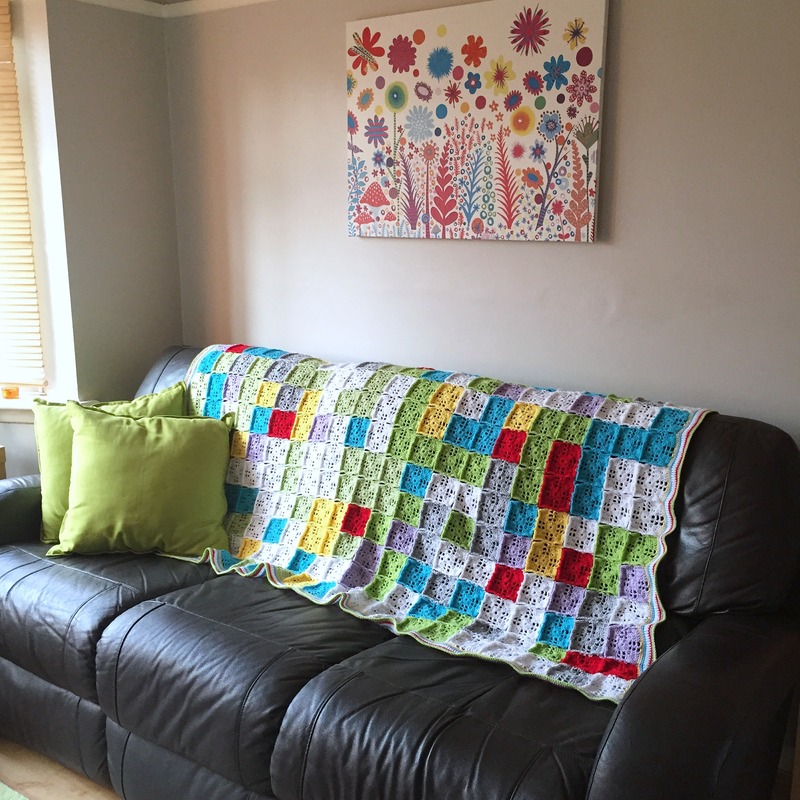 Completed size with border is 165cm x 135cm. I did some number crunching and at the end of 2014 I can reveal that I had 6% sad, 7 % irritable, 7% ditsy, 4 % stressed, 30% not great but not bad either, 29% happy and 17% grateful days. 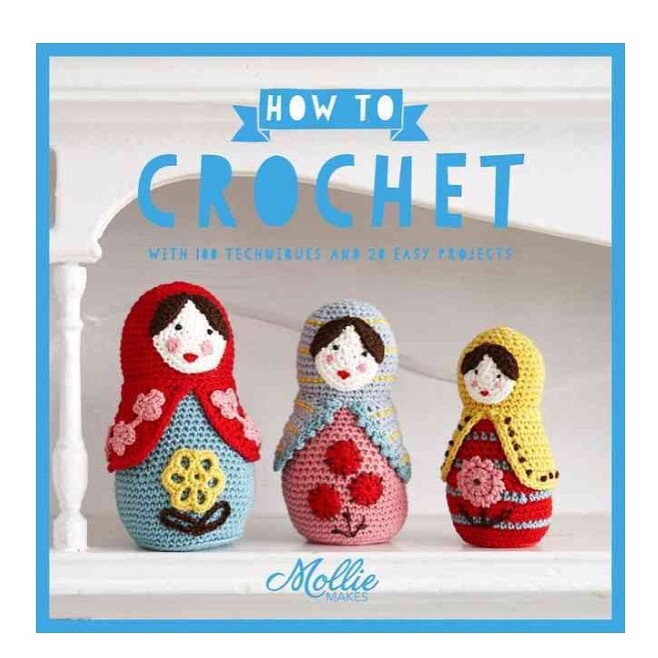 I know this because of a crochet blanket! How crazy and amazing is that?! Making the Mood Blanket was a great eye opener. I had to be honest with myself about my moods. If that meant that there were three days of being depressed, then so be it. Three grey squares it shall be. I also had to reflect on my day at the end of every day. Some days may have started as green (happy) days, but then something would happen at work which upset me and the day turned into a stressed day. At the end of the day I had to look back and decide what was the prevailing mood for the day: the happiness of the morning, or the stress? Did I allow the stress to get to me or did I look on the bright side and manage to keep my day happy. If I allowed the stress to get to me, then it had to be honest with myself and make the day a red day. At one point during 2014 I also realised that although I had lots of green (happy) days, I didn’t have that many grateful (turquoise) days. That’s not good and that’s something I had to, and still have to, work on. 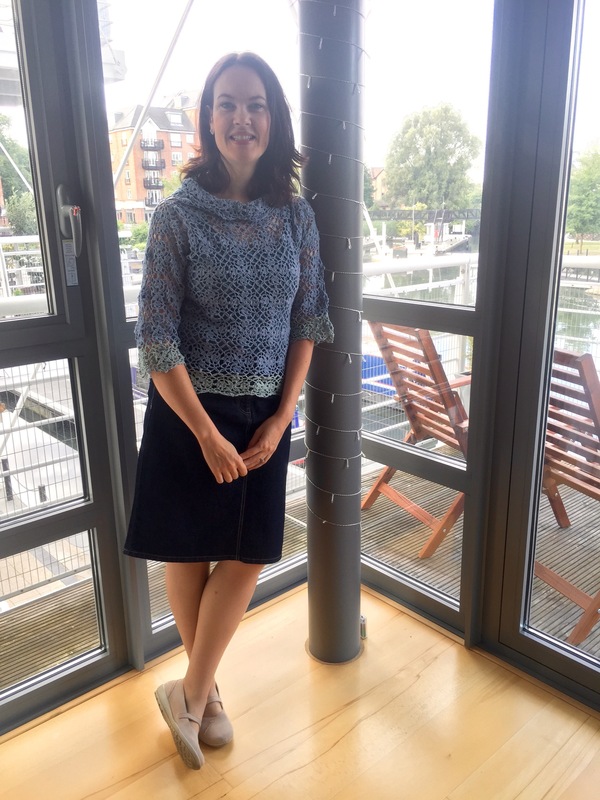 If you are ready to be honest with yourself and stick with it, you can use a crochet project to analyse your moods, attitude and emotions for a whole year. As a bonus you’ll have a blanket at the end of the year. I highly recommend it.